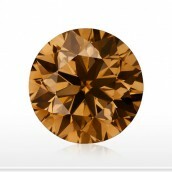 Champagne diamonds, otherwise known as brown, cognac, or even chocolate colored are in fact one of the few ways to portray extreme luxury at a very competitive price. This is because they are found in abundance, much more so than most other color diamonds such as pink, green, and blue stones. The warmth that this brown stone exudes, paired with its affordability and recent popularity, makes a fabulous choice of stone for earrings. Whether worn as studs, hoops, or drop earrings, with a stronger or weaker intensity, champagne diamond earrings come in a wide range of shades and styles. 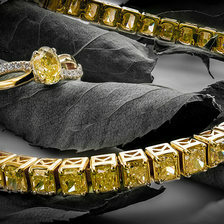 Most color diamonds are available in a pure color as well as several color combinations. They are also found in various color intensities. Champagne diamonds are found with a pure brown color or with secondary colors that may include yellow, yellowish, pink, pinkish, orangy, greenish, greenish yellow, purple, and reddish. The intensity level of a champagne diamond can be light, fancy light, fancy, fancy deep, and fancy dark. Champagne diamonds of all shades and color intensities go exceptionally well with colorless diamonds and look terrific as center stones surrounded by colorless diamonds for halo earrings or halo ear pendants. A stunning pair of 18K White & Rose Gold diamond Pave Earrings. 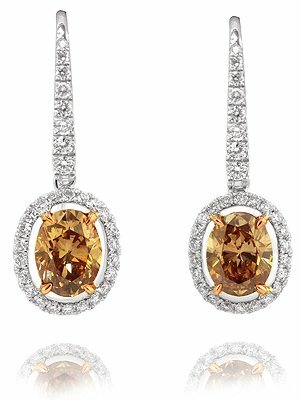 The earrings are set with a matching pair of 2 Oval shape Fancy Yellow Brown diamonds VVS2 & SI1 Clarity, weighing a combined TW of 2.05ct. 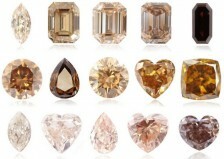 Champagne diamonds can be attained in all shapes and a wide range of sizes. These shapes include round, princess, cushion, pear, marquise, radiant, emerald, oval, heart and everything in between. Since champagne diamonds are more easily obtainable in larger sizes and are less expensive than many other types of diamonds, there are so many choices when it comes to champagne diamond earrings. In addition to champagne diamond studs, whether with a solitaire stone or as a halo earring, champagne diamond earrings can come in the form of hoops, drop earrings with a single stone, drop earrings with multi stones, as well as a wide selection of pave champagne earrings. The earrings can be created with champagne diamonds of different hues, of the same or similar hue, or with several color diamonds. Champagne diamonds are well complemented by pink, yellow, and green diamonds, in addition to the standard colorless diamonds. Many celebrities from Kristen Bell to Jennifer Lopez to Elisabeth Moss have been seen sporting champagne diamond jewelry including champagne diamond earrings. 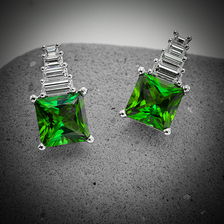 The effect of these earrings is glamorous and elegant without going overboard. The endless possibilities of designs and settings for champagne diamond earrings leave an appealing option for everyone. Classic like the colorless diamonds but also unique and subtle, earrings boasting champagne diamonds are jewelry pieces to be cherished. Are Champagne Diamonds More Expensive?